A mural of 16-year-old Jose Antonio Elend Rodriguez on the street where he was killed. A RARE SECOND-DEGREE murder trial of a US Border Patrol agent accused of shooting across the international boundary into Mexico and killing a teenager is set to start with jury selection. 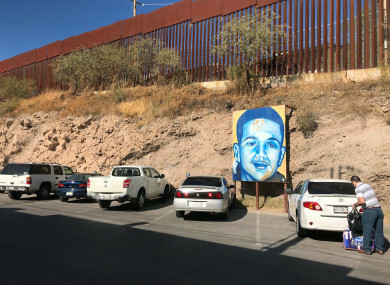 The trial starting today comes amid President Donald Trump’s crackdown on illegal immigration and his promise to build a wall along the 3,200-kilometre US-Mexico border. Following jury selection, opening statements would take place later today or on Wednesday, said Cosme Lopez, spokesman for the US District Court for the District of Arizona. Lee Gelernt, a New York-based lawyer with the American Civil Liberties Union, said he believes Swartz will be the first border agent prosecuted by the US Justice Department in a fatal shooting across the international border. Prosecutors say Swartz opened fire at about 11.30pm on Oct. 10, 2012, through the metal poles of a 6-metre fence that sits on a 7.6-metre embankment above Mexico’s Calle Internacional, a street lined with homes and small businesses. Swartz’s lawyers have said Elena Rodriguez threw rocks just before he was shot in an attempt to create a distraction for drug smugglers and that the officer was justified in using lethal force. They want jurors to visit the site at night to experience the area after dark. The US Attorney’s Office has said it won’t dispute that the boy was throwing rocks, but it’s unknown if he had any link to drug smugglers. They argue an unreasonable amount of force was used. Defence attorney Sean Chapman has declined to comment while the trial is ongoing. A spokesman for the agents’ union, the National Border Patrol Council, did not respond to multiple requests for comment. The case is expected to last more than a month and activists who oppose US border policies say they will rally outside the courthouse. Email “US agent goes to trial for the killing of an unarmed Mexican teenager across the border”. Feedback on “US agent goes to trial for the killing of an unarmed Mexican teenager across the border”.